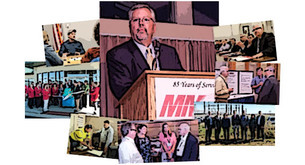 The MMUA Leadership Academy is a locally-based and affordable, high-level executive leadership development course, focused on meeting the needs of Minnesota's municipal utilities. The curriculum was developed and tailored to your needs based on feedback from current and recently retired municipal utility leaders at a series of focus groups. The Academy is designed to instill key skills, awareness, and perspective that 21st Century municipal utility leaders need. The Leadership Academy is so much more than a speaker series or training. It is true leadership development that is relevant and sustainable. In this program we will utilize time-tested content, approach and activities that will enable leaders to become aware of any executive leadership blind spots, and then to actualize a pathway for becoming a better leader. The Leadership Academy is a two-year program designed for both current and future senior leaders. Four two-day sessions per year will be held at the MMUA office, with an allowance for travel time on both days. The first day of each session will feature a networking dinner and focused discussion. Class size is limited to 25 students. The lifecycle of a typical session begins with prior weeks of preparation in reading, assessments and thought provoking questions. There will also be individual and team assignments that prepare you to be engaged during the session. During your time together, the group will discuss the preparation materials, accountability group reports, perform team and individual based exercises, gain insight from speakers, and frame and initiate next session homework. The curriculum will consist primarily of various articles and materials provided electronically. Typically, a book on leadership will be assigned for reading prior to each session. Students will go through an assessment between the first and second course sessions to help the instructor and the students understand their styles, strengths and potential deficiencies in key competencies. Students will have tasks to work on between sessions and will be expected to do some journaling. Each session is a crucial building block in developing the skills, awareness, and perspective of a true leader. Enrollment into this session requires that attendees take sessions 1, 2, 3, 4, 5, 6 and 7. Each session is priced at $600, which includes books and materials as well as the cost of the group dinner. The annual cost is $2,400 and the full two-year program fee is $4,800. You can opt to pay for the full tuition ($4,800), make two annual payments ($2,400 each) or pay by the session ($600 each). Note: Our website will only show the $600 charge at check-out. If you opt for the full or annual payments, select the BILL UTILITY OR COMPANY option and we will bill you accordingly. Ask for MMUA's corporate rate—$85 per night plus tax for standard King or 2-Queen; $95-$100 per night plus tax for King Suites. Ask for MMUA's corporate rate—$85 per night plus tax. You must call to get our rate.